Dave and I had a really spectacular long weekend in the beautiful Berkshires. Everything there is lush and green. We went for some fun hikes, we swam, picked and ate wild blueberries on the top of a mountain, and enjoyed a visit to Massachusetts Museum Of Contemporary Art (Mass Moca). I’ve posted about it before here. One of the exhibits we enjoyed was entitled Badlands: New Horizons In Landscapes. The exhibit features many artists perspective on landscape art engaging new ideas about exploration, land use politics, and the relativity of aesthetic beauty. One artist, Vaughn Bell created Personal Home Biospheres suspended from the ceiling. 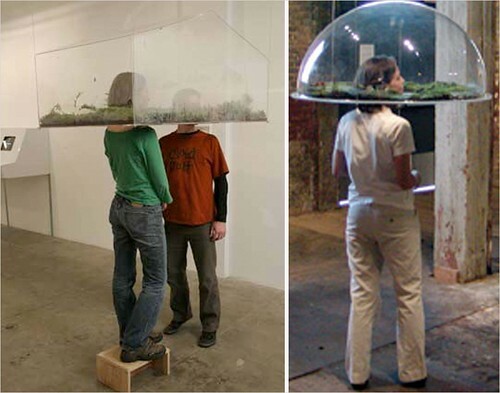 They were small scale natural environments encased in Plexiglas domes. We put our heads through the opening in the bottom of each biosphere, literally inserting ourselves into the micro- environments. Bell uses the natural fauna from the Berks. I thought each biosphere was aesthetically interesting and I enjoyed the interactive experience of entering the mini environment. I love Pease farm. But there’s a place in Great Barrington too on Rt. 7 heading south, you’ll see the sign. I love love love the Berks!! Have so much fun.